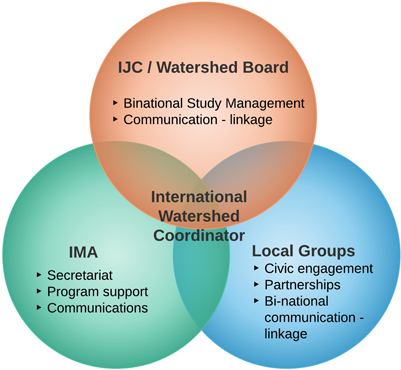 The International Watershed Coordination Program (IWCP) provides bi-national coordination and communication of research, management and citizen engagement for the shared waters of the Rainy-Lake of the Woods watershed. Local: individuals, groups and agencies engaged in watershed activities throughout the bi-national basin (for more information, check out the Stewardship in Action tabs on this website). Regional: The International Multi Agency Arrangement (IMA) collaboration of research and resource management agencies in Canada and the U.S. The program is a collaborative of the Lake of the Woods Water Sustainability Foundation, the International Joint Commission and the Minnesota Pollution Control Agency in partnership with the Koochiching Soil and Water Conservation District. Program development and delivery is coordinated by an International Watershed Coordinator in collaboration with partners throughout the watershed. For more information, contact the Coordinator, Kelli Saunders, at 1-807-548-8002 or ksaunders -at- lowwsf -dot- com.